This is my first foray into sewing for children, made for a dear friend of mine in Japan expecting her first baby at the end of this month. Given that almost everyone I know has had children by now or is in the process of having them, it’s surprising it’s taken this long for me to make something for small people. Initially, I didn’t feel I was good enough at sewing, and didn’t want to hand over poorly-made items to expectant mothers. And in the last couple of months, although several people close to me gave birth, I simply didn’t have the time to make anything and popped to the shops instead. And oh my, isn’t baby stuff cute? I may not want children of my own, but I could shop for other peoples’ all day. Anyhow, this year my work situation has calmed down, and I have time to sew again. The pattern is the Newborn Kimono Shirt by Purl Bee, and it’s a free PDF download. It’s only available in the one size, which is newborn, as the name suggests. For someone who has never made an item of baby clothing, the pattern pieces seemed impossibly small – really, a child will fit into this?! – but once it’s made up, it seems more realistic. I didn’t really use the instructions provided. I chose to do French seams for all the seams, not just the shoulder seams, but I don’t really recommend it as I had a tiny bit of wrinkling at the armholes that I couldn’t fully press out. But hey, the insides are neat! I also used my usual method of attaching bias binding, rather than trying to sandwich the seam and sew it in one go, and made mine narrower as I liked the look of it better. The fabric is by Copenhagen Organics, and is simply called Duck. I got half a metre of Cobalt Blue for the shirt, and a fat quarter of Light Blue for the bias binding, which I made myself using my trust little Clover tool. I ordered it from By The Yard, who seem to specialise mostly in quilting fabric. They had quite a few cute prints to choose from! I got my snaps from Geoff’s Emporium. I wasn’t quite sure was “Size 1” snaps were, so I just bought 11mm nickel ones. It was hard to find sew-in ones, most of them were the pronged ones. I chose to just use one snap to fasten it – I’m not a fan of the super-obvious placement of them on the Purl Bee tutorial. If I made this again, I would also put some kind of interfacing or stabiliser where the snaps go, as there’s some stress on this area. This didn’t occur to me until after the fact, though, and since babies aren’t newborn for long, I think it should be okay. I wrote the fibre content of the fabric and washing instructions on a little card from a set my Mom bought me, “Hootiful” stationery, and attached it with a tiny safety pin and some thread. 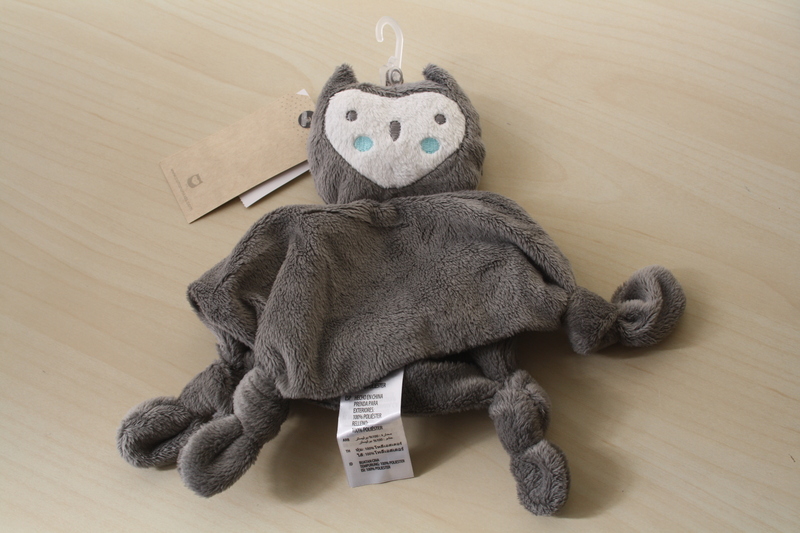 Easily removable and no irritating tag on baby’s skin. I didn’t make this – I bought it from Cotton On Kids – but isn’t it so cute? It’s a comfort toy, and it’s very soft. I was going to get a bib from Cotton On, too, as they had some adorable ones (including a French pigeon wearing a beret) but every one I picked up was flawed – messy stitching, puckered fabric, binding not lining up – and I just couldn’t bring myself to pay for something so poorly made. So this little dude it was. My friend let me know she received the shirt and toy just today, and just in time, as she’s due in 4 days! She loves it, and I’m glad my first foray into making clothes for babies was a success. Have you made anything for babies or small children? What are your favourite go-to patterns? Feel free to link me up – there’s more babies coming! The kimono is very cute and also practical, I love the fabric. Top tip for baby clothes – they have to be easy on and off with wide neck opening (as you’re not so into kids I won’t go into gory details, just trust me ok 😉 ) – this one looks perfect. I’ve just been commissioned to make a sunhat, my friends about to become a grandma and the baby will be Australian so will need sunhats, but she can’t find any to buy in the UK at this time of year. 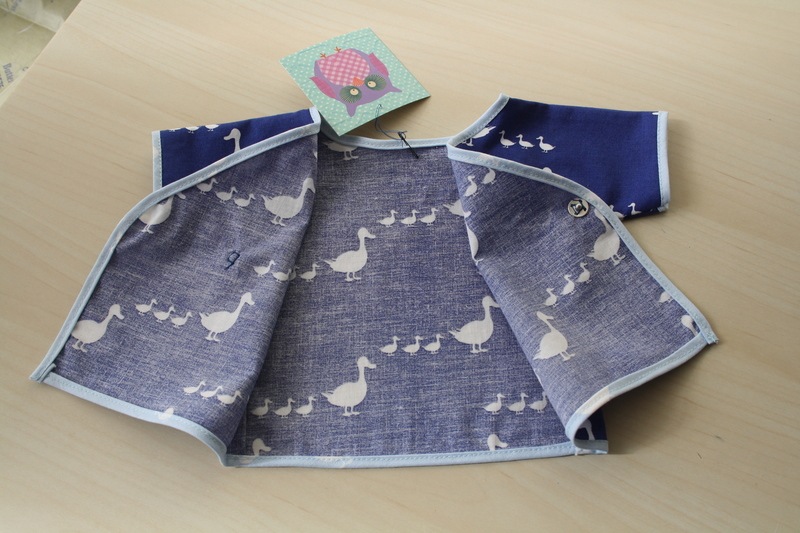 Oliver and S have a great free pattern for a reversible one, great for using up fabric scraps. The only thing to look out for with the pattern is yes, the seam allowance is included (it took me hours to figure that out) and pinning&attaching the crown to the sides can be a nightmare but after that it’s plain sailing. The layette set is adorable, thanks for that link! And a sunhat is a great idea for babies in sunny countries, I’ll file that one away. Cheers! Newborn stuff is so tiny right and Premmie sized stuff is absurd! This is really cute and the binding scale works really well. I have made toys, pillows, mobiles, leggings and little girls dresses for bubbas but like you said, I always feel borderline on whether they’re good enough to give – I’m sure they probably are though. A friend made me a quilt which blew me away cos those things take time (!!) and I really didn’t care about any flaws. I just made some felt food that I will post soon which is good for toddler aged kids but is kind of finicky. Obviously I have baby stuff on the brain at the moment! Oh felt food sounds fun! I have some friends with toddlers, so that kind of stuff is useful too.